Stocker engines are built for the car owner that doesn’t have a desire for higher performance, but wants to take advantage of our technology to extend the life of their engine. With no corners cut or details overlooked, Stocker engines simply offer a high-quality alternative and ultimate peace of mind over a factory replacement. The factory replacement is the same engine that has likely already failed, leading you to read this page. Always remember that. All Stocker engines are equipped with Nickies™ Performance Cylinder Sleeves and the original IMS Retrofit™ by LN Engineering. 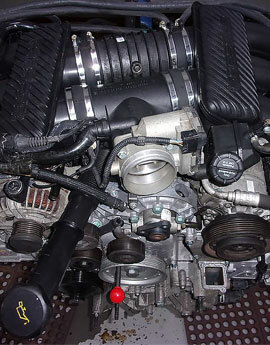 These engines are sold in “long block” form, requiring the accessories from the existing engine to be swapped onto them. The Stocker engines offer factory level of performance with all weak points and issues of the original M96/97 engine addressed, making it much more reliable and long-lasting. Since we keep numerous Stocker engine in stock, it is usually the fastest and most economical route to upgrade or rebuild your daily driver and enjoy your Porsche® again – for years to come. Note: Stocker engines are available for all applications from 1997-2008. If your engine or application isn’t listed above, we can still create a “Stocker” for you – it just isn’t currently in stock for immediate shipment. To receive a quote for a Stocker upgraded M96/97 engine, submit a ticket in the sales department.